There are over 100 species of Yarrow but only a relatively small number are common in commerce. The most popular are the colorful varieties of A. millefolium. These yarrows spread out from a center crown by popping up new growth along rhizomatous roots that travel just below the surface of the soil. Under most garden circumstances, they make lazy, sprawling garden companions for tall shrubs or soft ground covers for open sunny spaces. It is the tender loving care of extra water and fertilizer that causes this lax habit. In forests and on roadsides, these plants, deprived of summer moisture, remain small and sturdy. Used as a ground cover they can be mowed after bloom to promote low growth and fewer dead flower stems. Like many plants bred for color, as the hybrids naturalize and disperse seed they eventually return to the color of origin. For the humble yarrow, this is white. It is this yarrow that has many names like Soldier's Woundwort, many legends and traditional medicinal uses. 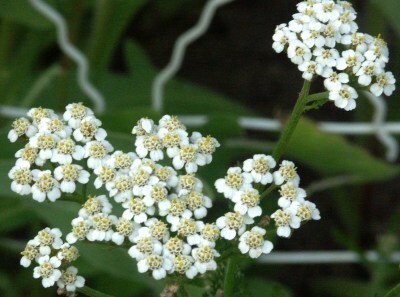 Thus, we offer the White Yarrow for those who also wish to use it to staunch bleeding or reduce external inflammation. Tuck a few in and around the garden for those times nippers mistake fingers for plant stems. Or, as Euell Gibbons puts it in Stalking the Healthful Herbs "I am sorry that I am not familiar enough with the use of Yarrow in conjuring up the devil to explain how it is done. I never need such charms or spells to summon the devil. All it takes is a few idle thoughts and a moment of inattention, and the old boy is right at my elbow suggesting something we can do or something we can leave undone." White Yarrow is an important butterfly nectar plant and makes a great addition to our Wildlife Herb Garden Six Pack and is sometimes included in our Butterfly Attractor 36 Pack Assortment. White Yarrow also makes a fun addition to our Edible Flower Herb Garden. Young buds and flowers can be added to stir-fry and curry.